Audio-Technica is now shipping a number of products that the company first showed off at CES back in January. The lineup of new releases includes the ATH-AG1X and ATH-ADG1X gaming headsets ($299.95 each), the ATH-MSR7NC Sonic Pro headphones with active noise cancellation (shown here, $299.95), the ATH-SR5BT wireless headphones ($199.95) and ATH-SR5 wired version ($149.95), and the AT-LP60-BT wireless turntable ($179.95). Details on each product are available below. Audio-Technica is now shipping a host of new products, including its ATH-AG1X and ATH-ADG1X premium gaming headsets, the ATH-MSR7NC Sonic Pro Hi-Res Audio compliant headphones with active noise cancellation, the ATH-SR5BT wireless headphones and ATH-SR5 wired model, and the AT-LP60-BT wireless turntable. All are currently available at authorized retailers in stores and online. The new top-of-the-line ATH-AG1X closed-back and ATH-ADG1X open-back gaming headsets deliver an immersive sonic environment that draws participants completely into the playing field. The headsets feature newly designed 53mm large-diameter drivers, an improved 3D Wing Support System for even greater comfort and much more. Both utilize core elements of the company's audiophile models to provide exceptional dynamics with impactful bass and precise localization of dialog, sound effects and music on a vast sound space. Both models (SRP: US$299.95 each) include a built-in microphone with a volume/locking mute control, along with additional features that make them compatible with popular gaming platforms and computers. Audio-Technica's SonicPro headphones are designed for listeners who are passionate about sound quality. The Hi-Res Audio compliant ATH-MSR7NC builds upon the rave-reviewed ATH-MSR7, winner of Reviewed.com and USA TODAY's 2015 Headphones of the Year Award, now with active noise cancellation added. The ATH-MSR7NC (SRP: US$299.95) is designed to deliver the highest level of accuracy and musical realism from high-resolution audio and other top-quality source material. It features proprietary (patent-pending) noise-cancelling and venting technologies that work together to maintain Hi-Res Audio reproduction in both passive and active-noise-cancelling modes. These smartphone-compatible headphones with in-line mic and controls feature Audio-Technica's 45mm True Motion drivers and two acoustic resistors that provide extended accurate bass and improved high frequencies. The portable, lightweight SonicPro ATH-SR5BT (SRP: US$199.95) headphones with Bluetooth technology employ aptX sound-improvement technology, specifically created to yield the best-possible audio performance over a Bluetooth transmission. Available in black or white, the ATH-SR5BT's rechargeable battery provides up to 38 hours of continuous use and can be recharged using the included USB charging cable. Powerful, specially designed 45mm drivers deliver exceptional resolution and clarity. The smartphone-compatible ATH-SR5BT remembers the last eight wireless devices for ready pairing with favorite audio sources. The headphones' flexible swivel design and soft memory foam earpads and headband offer total comfort. The ATH-SR5BT comes with a handy carrying pouch. The Audio-Technica ATH-SR5 offers all the features of the ATH-SR5BT except without wireless Bluetooth connectivity, at a suggested retail price of US$149.95. It's available in black, white and navy/brown. The ATH-SR5 is also Hi-Res Audio compliant, meeting an audio standard that ensures listeners will enjoy their favorite music with superb sound quality. The ATH-SR5BT also offers Hi-Res Audio performance when used with its supplied headphone cable (for non-wireless listening). Audio-Technica's fully automatic AT-LP60-BT wireless turntable makes listening to records easier than ever. It provides vinyl playback through compatible Bluetooth wireless speaker systems, sound bars, headphones, A/V receivers or other wireless playback devices. Available in a choice of black, white and navy finishes, the AT-LP60-BT (SRP: US$179.95) remembers the last eight wireless devices for ready pairing and features completely automatic operation--just push the play button, and the turntable does the rest, placing the stylus down at the beginning of the record and lifting up and returning the arm when the side is over. The turntable is designed to deliver outstanding sound, with a heavy-duty precision die-cast aluminum platter and a high-quality Audio-Technica Dual Moving Magnet stereo cartridge with replaceable stylus. The AT-LP60-BT includes a built-in switchable phono preamp and offers wired as well as wireless connectivity, enabling the turntable to be used with the widest variety of music and home entertainment systems, powered speakers, sound bars and A/V receivers. 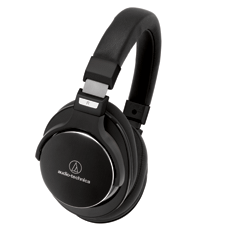 • Audio-Technica Debuts Five New Bluetooth Headphones at HomeTheaterReview.com. • Audio-Technica ATH-MSR7 Over-the-Ear Headphones at HomeTheaterReview.com.